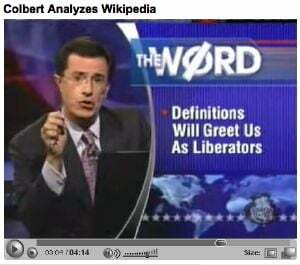 TV wit Stephen Colbert has had more fun at the expense of Wikipedia with another deeply ironic prank. 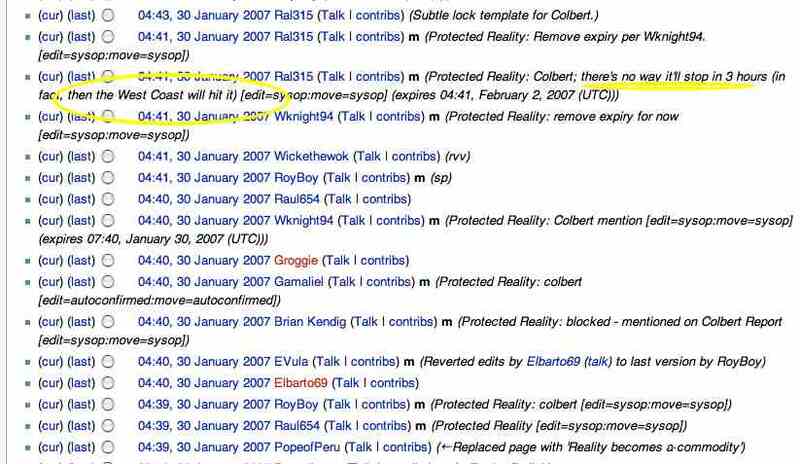 Last year Colbert satirized the project's dependence on the consensus theory of truth - which for Wikipedians is a feature, not a bug. 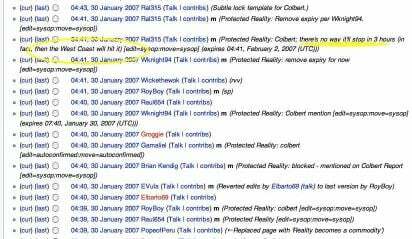 The project's guideline "WP:V" states, "The threshold for inclusion in Wikipedia is verifiability, not truth" [their emphasis] - and in practice this means that if you can can find a source on the notoriously reliable truth machine called the internet, then cobble up enough votes to support a notion, you win! Colbert last year on "The democratization of knowledge"
On his show The Colbert Report, the comedian seized on news that Microsoft had paid a contractor to fiddle with an entry about open source file formats. (Strangely, this splendid development has been coolly received. By paying people for contributing to Wikipedia, Microsoft was monetizing previously unpaid labour. Since almost all of Wikipedia's 1,000-odd "administrators" receive no pay for their hard work other than the pleasure of power tripping - seeing nothing of the $14m of VC money Wikipedia co-founder Jimmy Wales has banked - it's a valuable economic contribution). There's a transcript below to save you wrestling with the Comedy Channel's user-unfriendly video player, but in short, Colbert urged viewers to amend the entry for "Reality" to read "Reality Has Become A Commodity". Viewers obliged, forcing Wikipedia's version of Reality to be locked down, with administrators - quite wisely - warning of the damage that Californians could do to reality. I read the headline last week, "Microsoft offers cash for Wikipedia edit." Apparently, the software behemoth hired an Australian computer expert so they would be more favourable to Microsoft's products. Now I know a lot of people don't trust Microsoft - just because they've been accused of bundling software to crush smaller companies like puppies in a pile-driver. But I'm sure people are going to start trusting Microsoft again if Microsoft just pays someone to write an entry in Wikipeda on how people are trusting Microsoft again.
" ... very disappointed to hear that Microsoft was taking that approach"
Boo hoo, Comrade! Open source software is like free trade - and the invisible hand of the market has the mouse now. Now others out there are going to say, "Can't Microsoft's competitors pay somebody to change it back?" IBM can throw some of their money at perception and make their products "objectively better". Then Microsoft can fire their cash cannons back, and we're off to the races! This is the essence of Wikilobbying. When money determines Wikipedia entries, reality has become a commodity. And I'll give five bucks to the first person who goes on W and changes the entry on Reality to "Reality Has Become A Commodity". And to those who say "That's not what Reality is", I say "Go look up it on Wikipedia".